Last Chance to Give a Tax-Deductible Gift to BPL (Before the Ball Drops on 2013)!!! This is the last day of 2012 to help more than Two MILLION visitors to the Birmingham Public Library! You may donate today to have your contribution count toward the 2012 tax year. For information from the IRS regarding year-end giving, click here. We truly appreciate your support. You enable us to serve every corner of the City of Birmingham through our 18 locations- offering services, creating community and changing lives!! 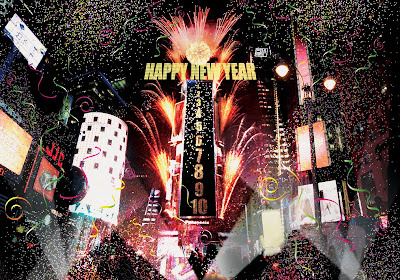 Happy New Year's Eve to you! Earn a free ticket to the circus! Children ages 2-12 may visit their local library to join the Reading with Ringling Brothers program and earn a FREE ticket to the circus! The Ringling Bros. and Barnum & Bailey Circus will be performing at the Birmingham Jefferson Convention Complex (BJCC) Arena this year from Thurs. Jan. 24th through Sun. Jan. 27th, and participating children who read five (5) books before then can get a free ticket to see the Greatest Show on Earth! Here's how it works: Speak with a librarian in the Youth Department at your local public library to register each child (ages 2-12). Each child must read at least five (5) books to receive his or her redeemable ticket from the library. The ticket is redeemable ONLY at the BJCC Concert Hall Box Office with the purchase of one (1) Adult ticket at full price. So, ladies and gentlemen and children of all ages... what are you waiting for? Hurry up and use your trapeze, unicycle, or clown car to get to the library! 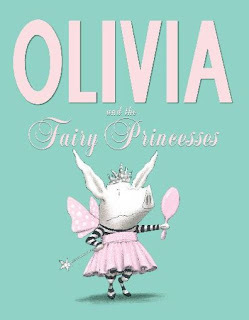 Every little girl piglet desires to be a princess, or do they? Olivia is depressed and believes she may be having an identity crisis. She refuses to be like all of her friends who dream of pink ruffly skirts with sparkles and little crowns. “If everyone’s a princess, then princesses aren’t special anymore!” So what will she be? Olivia needs to stand out! She has to be special! She wants to do more than just fit in! Join Olivia on her pink-free quest of self-discovery. 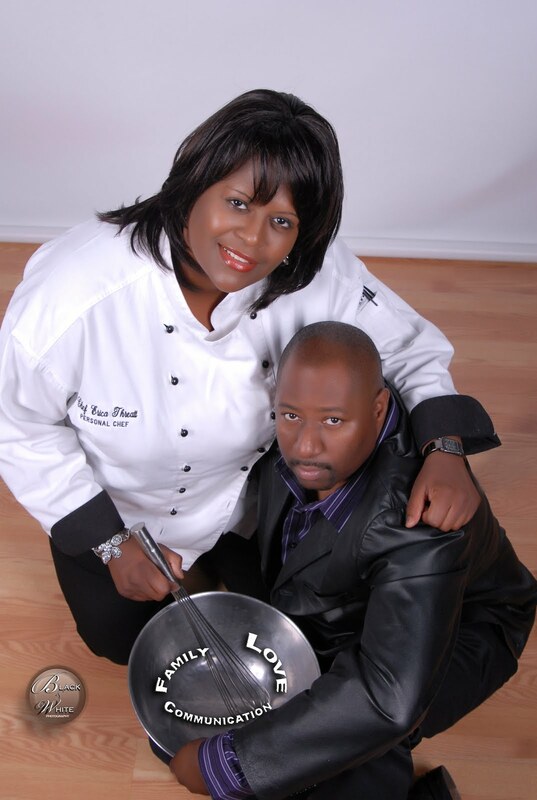 Chef "E" and her husband, Clarence Threatt. Hamburgers over the holidays? Sure, why not. Chef E of Birmingham, who has done several free cooking presentations at Birmingham library branches this season, has a recipe for a spicy cilantro turkey burger that's sure to please. Plus, it's healthy. On Friday, December 21, she'll make her last Birmingham Public Library cooking appearance for the month. She'll be at Powderly Library, 3301 Jefferson Ave. SW, from 10:00-11:00 a.m. She'll be showing how to use squash, yes squash, in desserts. For more info, call Powderly Library at 925-6178. The class is free. 1. Heat the skillet to medium heat. 2. In large bowl, combine ground turkey, Cabot 50% Reduced Fat Jalapeno, cilantro, red bell pepper, mayo and Montreal Steak seasoning. 3. Form mixture into equal patties. 4. In a large nonstick skillet, heat with 1 tbsp of olive oil. Add ground turkey patties and cook until burgers are done. 5. Serve burgers on Nature's Own wheat buns topped with tomatoes and spinach. NOTE: Chef E says you need to include the mayo in the recipe because ground turkey does not have fat in it and ground turkey can dry out when you cook it. Ground turkey is a lean white meat. The mayo will give the burgers moisture and flavor. It will help the burgers bind together as a patty. If you want to use reduced-fat mayo, you can. 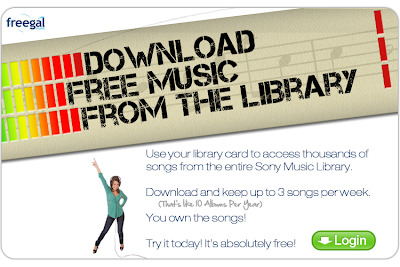 Free Music Downloads from Birmingham Public Library! Birmingham Public Library offers access to Freegal Music, an online service providing free music downloads to BPL patrons. Simply go to the library’s homepage (www.bplonline.org), click “Freegal,” and key in your library card number. Once inside, you can select from millions of songs from the entire Sony Music catalog and download up to three (3) free mp3 files each week. Freegal offers many of today’s top artists, a fantastic retrospective collection, and music from around the world. You can search by artist, song title, or album, browse by musical genre, or select from the national and “My Library” top download lists. Artists range from Adele to ZZ Top, and musical styles include hip hop, rock, jazz, country, classical, and everything in between. Freegal music files are DRM-free; they do not expire and are yours to use for as long as you wish. Freegal Mobile Apps are available from the iTunes App Store and the Android Marketplace. Weekly download limits reset every Monday. To access Freegal from BPL, you must have a current library card and residence within the city of Birmingham. Martin Luther King Jr.’s “Letter from the Birmingham Jail” is a moving testament to the passion and wisdom of the great civil rights leader. Since he penned it on the margins of old newspapers from a jail cell in 1963, this twenty-one page missive has come to be known by many as the most important document of the civil rights era. Since so many of the groundbreaking moments in the movement have hinged on speeches and demonstrations, this written account tangibly illustrates the mood, words, and feelings which defined a pivotal moment in American history. 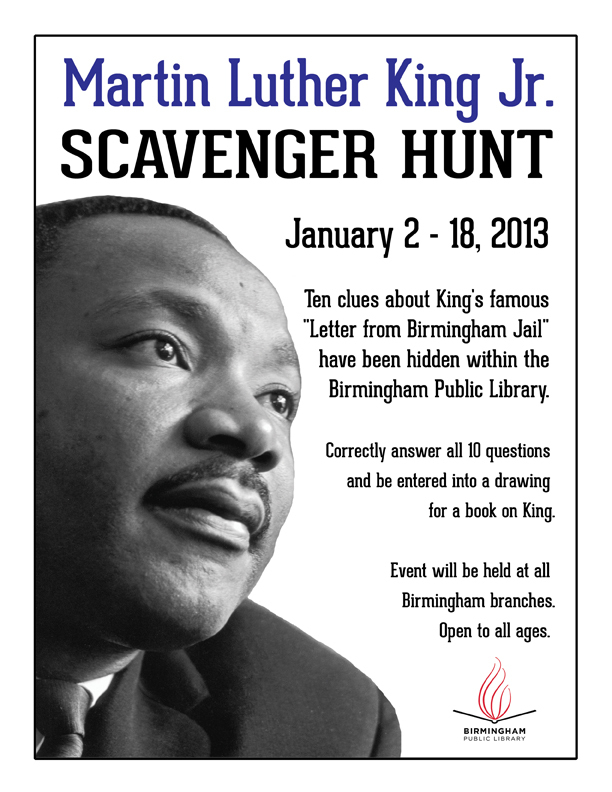 On January 2-18, all of the Birmingham Public Libraries will be posting a Scavenger Hunt which will enlighten as well as commemorate Martin Luther King Jr.’s famous letter from the Birmingham Jail. Young and old are invited to participate and get a glimpse of an American hero’s life. Participants will receive a small prize and be entered into a drawing for some books about this hero. Please join us! The Birmingham Public Library will host several free events in December 2012. Check the list for details. Sunday, December 2 - Open house and tablescape competition, 3 to 5 p.m., Springville Road Library, 1224 Old Springville Road. Friday, November 30, is the deadline to register for competition. This is the first time the branch has hosted a tablescape contest. "We'd like to give the community an opportunity to display their creativity, while also kicking off the holiday season,'' Sandi Lee, eastern region coordinator for the Birmingham Public Library system. Teams can decorate on Saturday, December 1, from 9 a.m. to 6 p.m. Voting will start on Sunday at 3 p.m. The table with the most votes will win. Call Kelly Laney at 226-4083 for more information about the contest. Also on Sunday, adults can decorate a bookmark, an ornament, or ribbon notebook with beads and ribbons. In the Children's Department, young ones can decorate ornaments, which they can take home or put on the Christmas tree in the Children's Department. There will be drawings for two rosemary trees. Books for children, teenagers, and adults will be distributed. Monday, December 3 - Festival of Lights with Santa and Mrs. Claus, 6 p.m., North Birmingham Library, 2501 - 31st Ave. North. Enjoy an evening with Santa and Mrs. Claus, crafts and refreshments. Call 226-4026 for information. Tuesday, December 4 - Catch Birmingham Public Library employees and volunteers in Birmingham's annual Christmas parade, which starts at Kelly Ingram Park at 5 p.m., goes past Linn Park, and ends at Kelly Ingram Park. The library will have a table full of information in Linn Park, too. The city will have caroling, children's arts and crafts, Santa, a 6:05 p.m. tree lighting, and more in Linn Park. The event ends at 7 p.m. Call 254-2391 for more information. 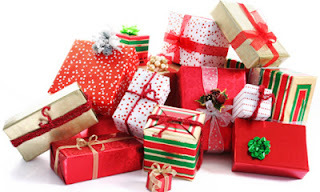 Wednesday, December 5 - Santa's Missing Mail, 4 p.m., Springville Road Library, 1224 Old Springville Road. Have a good laugh with puppeteer David Stephens as he puts on a funny play with Santa, his reindeer, and others. Call 226-4085 for more information. Wednesday, December 5 - A Christmas Memory with Dolores Hydock, 12 p.m., Central Library, 2100 Park Place. Hydock, a Birmingham storyteller and actress, has gained quite a following for her annual performance of A Christmas Memory. Presentation is part of the library's Brown Bag Lunch series. Refreshments will be provided by the Friends of the Birmingham Public Library. 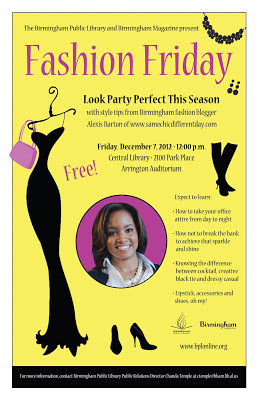 Friday, December 7 - "Fashion Friday," 12 p.m., Central Library, 2100 Park Place. Look party perfect this season with style tips from Birmingham fashion blogger Alexis Barton of www.samechicdifferentday.com. Door prizes from Belk, Betsy Prince, designer Roxy Rabb, and others. Birmingham magazine will be one of the presenters. Tuesday, December11 - A Christmas Memory with Dolores Hydock, Central Library, 6:30 p.m., 2100 Park Place. 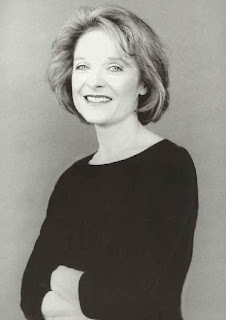 Hydock, a Birmingham storyteller and actress, has gained quite a following for her annual performance of A Christmas Memory, which is by Truman Capote. Presentation is part of the library's Brown Bag Lunch series. Refreshments will be provided by the Friends of the Birmingham Public Library. Tuesday, December 11 - "Around the World in 30 Instruments," 6:30 p.m., Springville Road Library, 1224 Old Springville Road. Husband and wife duo Aodh Og O'Tuama and Christy Martin will use different instruments from around the world to perform traditional music from various cultures. Call 226-4083 for more information. Wednesday, Dec. 12 - Gospel concert with Katrinia Pigler, 4 p.m., North Birmingham Library, 2501 - 31st Ave. North. Pigler will use her God-given talents to bring hope and inspiration through song. Call 226-4025 for more information. Monday, December 17 - December Family Night, North Birmingham Library, 6 p.m., 2501 - 31st Ave. North. Make reservations for a light dinner, art, and family fun. Call 226-4026 for more information. Various dates for Holiday Christmas Cooking with Chef E. Join Birmingham Chef E as she shows how to make creative and fun dishes for the holidays. Drop by Central’s Youth Department from December 13th through 18th to guestimate how many peppermints are in the holiday jar. A drawing will be held on December 19th from the correct estimates for the grand prize of an Elmo Stocking, with runner-ups receiving candy and books. It’s been about a month since I’ve written about anything on this blog because I ruptured my Achilles tendon and had to have surgery. Right now I’m using crutches because I’m not supposed to put any weight on my injured foot. As you can probably imagine, Christmas shopping will have to be done online, by phone, or I’ll have to make a gift using the wonderful Christmas books available at the Birmingham Public Library. I’ve come across a few really neat gifts online that are unique or can be personalized. Since it’s cold and flu season you might want to design your own Kleenex tissue box at http://www.kleenex.com/designyourbox.aspx. My mother found this one and used it to personalize two Kleenex boxes with a friend’s picture. Kleenex provides the background colors and graphics. You can even import your own graphics and pictures. They even have Disney graphics for children. Looks like there might be a buy three get one free promo code for Christmas. Everyone loves candy, right? Well, how about personalized M&Ms. That’s right, you can design your own M&M’s at www.mymms.com. You choose your color, write your message, and then add clip art or pictures. You have to buy a minimum amount and you can get several different types of packaging. You can even personalize your M&Ms with the logo of your favorite NFL team. Http://www.personalizationmall.com is the website for Personalization Mall.com and it has a plethora of items that can be personalized: notebooks, calendars, shirts, mugs etc. They have licensed brand gifts with the logos for NFL, NBA, MLB, Marvel, Elvis Presley, Curious George, Precious Moments, and Casper the Friendly Ghost. Shipping rates for Economy and Standard seem to be reasonable. If you don’t want to order anything for Christmas, take a look at the following books and make something for Christmas. You’ve still got time. Every wish on our Library WishList has been fulfilled!!! We're thrilled to report that as of today, the remaining wishes on our Library WishList have been completely funded! What a great holiday gift! We asked and you donated. 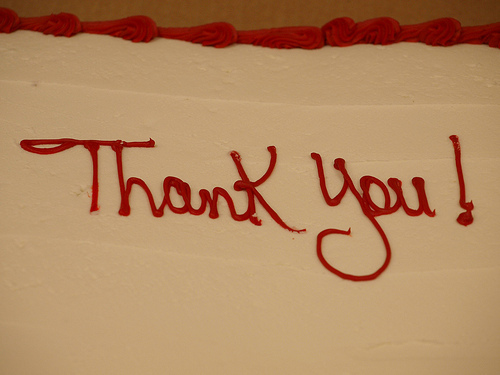 We want to thank everyone for spreading the word about our much-needed wishes. Two anonymous donors contributed significantly during our final push to achieve our goal. Likewise, our brilliant group of Young Professionals also made a significant donation for this initiative. We truly appreciate these contributions. We are so very fortunate to have supporters like you. Thank you for your good-will and your promotion of the Library WishList. We hope you have a nice holiday season and an excellent New Year! If you haven’t heard of Pinterest, you’re way out of the social media loop. Thriving on visually-stimulating images ranging from ecru laced bridal gowns to poke chocolate cakes with caramel oozing down the sides and a mountain of whipped cream floated precariously on top or an inspirational quote that could bring even the cantankerous Grumpy Cat to grin ever so slightly, millions of people have jumped on the virtual cork board wagon. Founded by Ben Silbermann, the site was launched in 2010, and it has gained meteoric rise among the social media massif. The idea was to allow people to express themselves, sharing and discovering things online and through friends and families. Today, more than half of Pinterest users are female, and one out of five woman have active accounts, with the strongest activities coming from Alabama, Tennessee, and Utah. As of August 10, 2012, Pinterest was opened to everyone without a request or requiring an invitation. Additionally, the Pinterest app for Android and iPad was launched a few months earlier on April 14, 2012. Brides: Many brides-to-be have replaced bulky three-ring binder wedding planners with the simplicity and portability of a Pinterest account. Home Décor: Some people create a Board for each room in the house and then pin decorating ideas for that room. Art: Artists use it to organize inspiring images for their work. Recipes: Cooks keep an online recipe box. College students might create a shopping list of things they need to buy for school. DIY: DIY-ers can bookmark tutorials for those rainy day projects. Pin: The main idea of Pinterest is to “pin” pictures to boards. A pin can be what you put on the board, but it can also mean the act of placing something on the board. Board: These are virtual cork boards or pin boards. You can name them according to the group of pins you want in that category. People use their “boards” to share pictures about their interests. You can also browse other boards created by other people. If you really like the board, you can “follow” it or all the user’s boards. Repin: When you see a pin that you like, you can “repin” it and place it on the board you want. Like: If you see a pin you like but you don’t necessarily want to pin it on one of your boards, you can just “like” it. Follow: “Following” a board or a Pinterest user means that you will see that person’s pins on your Pinterest homepage. Comment: You can also leave a comment on your or other people’s pins. The Birmingham Public Library Public Computer Services department offers an Introduction to Social Media course which covers Pinterest. You may peruse through the handoutand other course handouts on the Regional Library Computer Center blog. For more information on the Social Media class and other classes offered, you may contact the department at (205) 226-3799. And if you're ALREADY pinning on Pinterest, make sure to follow BPL's great account! Teens, get your poetry on at the Flow Tactics Teen Open Mic every 3rd Saturday from 6:00 to 8:00 p.m.at the YMCA Youth Center, 2400 7th Avenue North (near Phillips Academy). Admission is free. The sessions are for high school students only. To sign up to perform or for more information, e-mail johnpaul@reallifepoets.org. December's program is scheduled for Saturday, December 15. Flow Tactics is sponsored by The Real Life Poets, the Mayor's Office Division of Youth Services, YMCA Youth Center, and the WORD UP! Student Poetry Slam Committee of the Jefferson County Library Cooperative. WORD UP! is an annual poetry slam for Jefferson County high school students hosted by the Birmingham Public Library. Family Creative Arts Night, an arts and poetry program for children and parents, will be held on Monday, December 17 at 6 p.m. at North Birmingham Library, 2501 31st Ave. North. This event will be lead by a husband and wife team. Call 226-4026 to register. A Family Poetry Night will be held on Tuesday, December 18 at 6 p.m. at Springville Road Library, 1224 Old Springville. This class will be lead by two Real Life Poet Inc. facilitators. Call 226-4085 to register. The classes are sponsored by Birmingham Parent University, the Birmingham Education Foundation, Real Life Poets Inc. and the Birmingham Public Library. Advance registration is appreciated. Light snacks will be served. To register, go to www.bhamparentu.com, call the listed library numbers or register in person at the two listed libraries. More family events like these will be held at Birmingham library branches in 2013. Flow Tactics Teen Open Mic is held every third Saturday, 6 to 8 p.m., at the YMCA Youth Center, 2400 Seventh Ave. North. Admission is free. The next one will be held on Saturday, December 15. This event is for high school students. To sign up to perform or for more information, email johnpaul@reallifepoets.org. Flow Tactics is sponsored by Real Life Poets, Inc., the Mayor's Office Division of Youth Services, YMCA Youth Center, the WORD UP! Student Poetry Slam Committee of the Jefferson County Library Cooperative and the Birmingham Public Library. Bards & Brews, the popular poetry performance/beer tasting series, is usually held the first Friday of each month from 6:30 to 9 p.m. at various locations in Birmingham. 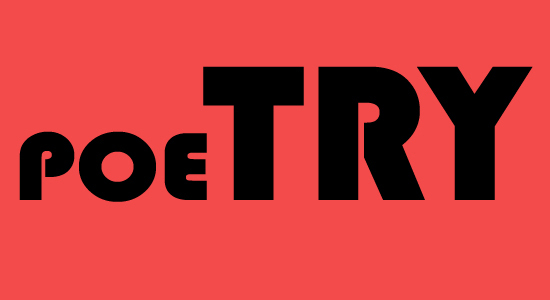 The next session, which will be a poetry slam, will be held on January 4, 2013, at the Central Library, 2100 Park Place. Slams are held quarterly; the other sessions are open mic. The event opens with live music at 6:30 p.m., and poetry performances start at 7 p.m.. Brian “Voice Porter” Hawkins serves as emcee. The program is free and open to the public. Craft beer will be available for sampling. Light refreshments will be served. Attendees must be 18 years or older to be admitted, and 21 years or older to be served. IDs will be checked. This program is funded in part by the Alabama State Council on the Arts. For more information, call 226-3670. Gifts of a Wordsmith, an adult poetry workshop, is held every first Tuesday of the month, 6 to 8 p.m., on the second floor of the Central Library, 2100 Park Place. John Paul Taylor of Real Life Poets, Inc. is the coordinator. For more information, call Taylor at 585-8271 or email him at johnpaul@reallifepoets.org. The WORD UP! 2013 Poets Showcase will be held on Saturday, January 12 at 2 p.m. in Arrington Auditorium of the Linn-Henley Research Library. Tessica "Lady Tess'' Williams will be the headliner. She is the the first place winner of the 2012 Southern Fried Poetry Slam, which was held in June. Flow Tactics Teen Poetry Workshop is held the first Saturday of every month, 2 to 4 p.m., on the second floor of the Central Library, 2100 Park Place. 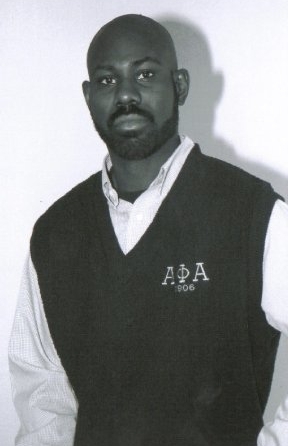 John Paul Taylor of Real Life Poets, Inc. is the coordinator. For more information, call Taylor at 585-8271 or email him at johnpaul@reallifepoets.org. WORD UP!, an annual poetry slam competition for high school students in Jefferson County, will be held on Sunday, April 7, 2013, at 3 p.m. at the Central Library, 2100 Park Place. Students will compete in competitions at their schools. Winners from each school will face off at the annual WORD UP! competition at the downtown Birmingham library. The 2013 theme will be civil rights in honor of the 50th anniversary of the civil rights movement in Birmingham. 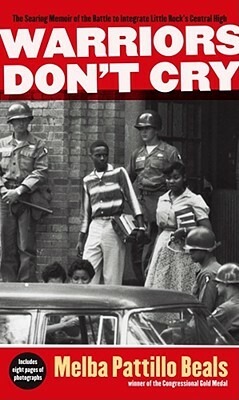 Students will be asked to choose from one of six civil rights-themed photos selected by the WORD UP! committee. Students will use their selected photo as the inspiration for their performance. The program is funded in part by the Alabama State Council on the Arts. For more information, call 226-3670. Voices From the Storm: Our Spirit Will Not Be Broken Anthology, a collection of poems, essays, prose, photos, and artwork that looks at the effects of the April 22, 2011 and Jan. 23, 2012 tornadoes, will be released in late 2012. Entries were written by Jefferson County residents of all ages, including students. Real Life Poets, Inc., the Birmingham Public Library, the Birmingham Museum of Art and the Jefferson County Library Cooperative helped with publication. For more information, call 226-3670. John Montgomery, founder and president of Big Communications, helped implement the Birmingham Public Library's rebranding and awareness campaign in the summer of 2012. With very limited resources, Montgomery and his company developed the system's "Champions of Learning'' educational initiative by recruiting Olympic gold medalist Vonetta Flowers to become the face of the campaign. The campaign showed the importance of having libraries in the community and the value of lifelong reading. John Paul Taylor, artistic director of Real Life Poets, has conducted poetry workshops at the Birmingham Public Library since 2010. He helps give students the basic literary skills they need to write engaging poetry. What first started out as three workshops in 2010 to help prepare high school students for a countywide poetry slam competition for 2011, has grown to monthly classes that are now offered for students and adults at the library. Recently, Taylor partnered with the library and the Birmingham Education Foundation to offer workshops for families as part of Parent University programs. Taylor's organization also helps present the annual WORD UP! competition in the spring. Elinor and Winfield Burks host math and science programs at the Five Points West Library every year and visit several Birmingham Public Library branches in January and February to teach students about George Washington Carver and his peanut research. In 2011, they received a Kresge Foundation grant that helped them develop after-school science programs for the Birmingham Public Library system. They reached 1,395 participants during the school year. Their efforts have helped erase the stigma that science is too hard or that a science career is not a realistic possibility. The Redmont Neighborhood Association has donated $30,500 to The Library at Birmingham Botanical Gardens over the last 10 years. The money has been used to buy materials for the library. 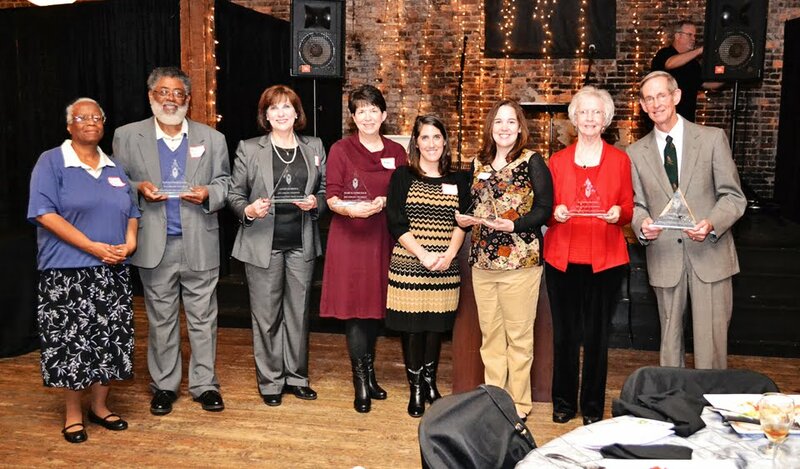 The association strives to make its community better through libraries. Jackie Hambrick joined the city of Clay's library committee in 2006, working to establish a library for Clay. She worked tirelessly to research funding options in order to transform a 1905 farmhouse into a modern public library. The committee faced many obstacles, but Jackie never retreated. In October 2009, her persistence paid off when the city's library opened in the renovated farmhouse. Today, she remains committed to helping the library. Daphine Munson has volunteered in the Homewood Public Library's Friends' Bookstore two days a week, for the last eight years. When someone can't make it to work, she volunteers to work their shift when she can. The bookstore and the library benefit greatly from her efficiency and dependability. She is always there to lend a helping hand and a smile. She's been a member of the Friends of the Homewood Public Library since 1987. Michael Krawcheck, a member of the Hoover Library Board of Trustees since 1996, is an advocate for the library and its employees. He knows all 100 employees by name, has attended more than 200 monthly meetings and special events at the library and he's been known to buy lunch for employees standing behind him in line at the library's coffee cafe. Employees and library patrons appreciate his presence and dedication. Mary B. Undeutsch has volunteered at the Leeds Jane Culbreath Library since 2005. She works in the cataloging and circulation departments, where she stamps, tags and repairs materials; checks in books from van deliveries; and straightens shelves with ease and enthusiasm. Vestavia Hills Public Library's People Affecting Library Success (P.A.L.S.) is made up of young mothers, who volunteer to secure thousands of dollars to help fund programming and materials in the library's children's department. For the last four years, their funding has helped make the library's summer reading program a success. Without P.A.L.S., the children's department would not be what it is today. A Christmas Memory, Truman Capote's poignant reminiscence of his boyhood in rural Alabama, is brought to vivid life by Birmingham storyteller and actress Dolores Hydock in her one-woman performance. Tuesday, December 11, 6:30 p.m., in the Arrington Auditorium at the Central Library. 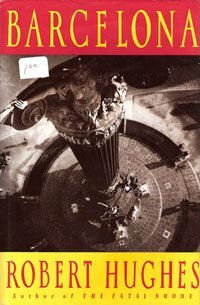 The strong vote for Catalan sovereignty on November 25, 2012, gives new occasion for re-reading Robert Hughes’s Barcelona, the serious traveler’s must-read adjunct to the Lonely Planet and DK travel guides. Mr. Hughes, recently deceased, was the art critic for Time magazine and had authored The Shock of the New and The Fatal Shore before bringing out Barcelona, an enormously successful critical survey of the art, architecture, and literature of the semi-autonomous Spanish region, Catalonia. In Mr. Hughes’s Barcelona the Catalan people’s impulses toward political independence and distinct cultural identity reinforce each other through years of medieval empire and glory, centuries of subjugation and repression followed by the brilliant Art Nouveau flowering of the Catalan Renaixance including, most particularly, the beloved masterpieces of Antoni Gaudi. The vibrant urban scene laid before travelers today is largely beyond the scope of Hughes’s book, published 20 years ago, but it’s all there just as he describes it—the vast gothic quarter, largest extant in Europe; the leafy boulevards and elegant facades of the Eixample, Barcelona’s unique, also vast, Art Nouveau district; and the Catalan flags with the single star for independence hanging off balcony after balcony, street after street. Barcelona is a city of merchants, artisans, fishermen, sailors, and builders. Hughes saw their egalitarian spirit in the simple wide spaces of their civic buildings and spare churches, so unlike the frilly Gothic of aristocratic France with its long high naves enforcing hierarchy and class distinction. Barcelona’s spare Cathedral in the Barri Gotic is the widest of its era in Europe, places all Catalans near the altar and the holy relics, all Catalans by right, the same before God. The careful restorations and thoughtful public amenities of today’s Barri Gotic reveal a deep respect, even longing for the ancient independent Barcelona. History—for three hundred years Barcelona became a stagnant city trapped behind its medieval walls, between two Spanish fortresses by their Castilian rulers. Little was done and little built, until the industrial revolution found native genius in Catalonia. They built manufacturing enterprises in the villages surrounding Barcelona and burst through the city walls creating the elegant district, Eixample. (Eixample is the Catalan word for extension or expansion.) Hughes discusses the Catalan nostalgia for rural life and their reverence for handicraft which contributed to Barcelona’s embrace of Art Nouveau as they were tripling the size of their city. Barcelona saw the natural forms of their Art Nouveau (Modernisme) as expressive of Catalan identity, as political assertion of power and rights—Catalan naturalism and elegance, as opposed to Castilian Neoclassicism and Baroque excess. Choral societies of working men sang traditional songs in the long forbidden Catalan tongue. A stained glass and tile Art Nouveau masterpiece, the Palau de la Musica, was created for their performances and is still in use. Here we enjoyed a performance by the Alyn String Quartet under an inverted stained glass dome. This brings us to Antoni Gaudi, the star of the Catalan Renaixance, an architect whose popularity has grown to match Frank Lloyd Wright’s but whose works are all readily seen and easily toured walking through Barcelona. The highlights include Casa Mila, Parc Guell, Casa Batllo, Palau Guell, and the enormous civic landmark, the Sagrada Familia. Modern eyes see flowing Art Nouveau forms trending toward the surreal, but Hughes’s book helps us see these exquisitely crafted buildings through the eyes of Gaudi and Catalan nationalists. Since their political expression was repressed, their love of homeland found expression in Gaudi’s forms and symbols. St. George, the patron saint of Catalonia, slays the dragon on the roof of casa Battlo. The dragon’s bones and flowers decorate the façade. Here is a flowering of culture, architecture and political longing stamped out by events in history—WWI, economic depression, the Spanish Civil War and the brutal Franco dictatorship. Happily the buildings remain, meticulously maintained, still symbolizing the city’s aspirations. And so Mr. Hughes’s book ends, but not before mentioning the great children of Barcelona’s Renaixance—Picasso, Dali, and Miro. One can still drink at The Four Cats where Picasso had his first show and visit the Picasso Museum both in the Barri Gotic. Dali has three museums in Catalonia, including one near Barcelona’s cathedral. Of the three Miro is most closely identified with Barcelona. He built his museum up on Montjuic near the Olympic stadium and filled it with his best work. And so today Barcelona is experiencing its third great period of growth: the build-up for the 1992 Olympics and the long productive aftermath, maintaining its architectural heritage and building brilliant public spaces, displaying a native design excellence in everything from new monuments and sculpture to window dressing, door handles, and even graffiti. Barcelona is a world city. Recently a million Barcelonans poured out spontaneously onto the streets to demonstrate their readiness to take the world stage as the capital of Catalonia—independent again. Prior to this summer, I thought Twitter was for people who wanted to read what Ashton Kutcher was eating for breakfast. Truth be told, it can be used for that (provided Ashton tweets about it), but it can also be used for so much more. I didn’t understand Twitter’s potential until we had a presentation @bpl by social media guru, Wade Kwon @WadeOnTweets. He helped me understand that Twitter can provide information about what’s going on in the community right now. For example, during an event like Hurricane Sandy, you can get regular updates from federal, state, and local agencies as well as news organizations all at the same time. In addition, people living in the area can post photos and current information (Dave Rogers @livingonthecoast "Highway 90 is completely flooded!"). Consider how helpful this would be if you were following the updates using your cell phone. During this season’s hurricanes, utility companies were even posting updates about power outages on Twitter. 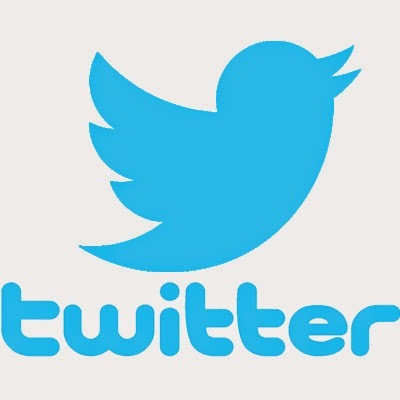 Of course, Twitter offers more than just news and information. Retailers, restaurants, and many other businesses use Twitter to post deals and specials that may not appear anywhere else. Don't call about the soup of the day, just check your Twitter account. If you follow particular celebrities or teams, you can get up-to-date information on concert dates, song and album releases, or in the case of sports, injury reports, postgame comments, etc. If you are going to an event, there is probably a #hashtag for the event (#Jazzfest) and you can keep up with what people are reporting about it. These are simple examples and don’t even scratch the surface of the many ways you can use Twitter. For your news, hobbies, event information, travel plans, and a host of other things, it is worth it to set up an account. Take it from a skeptic, Twitter has a lot to offer everyone. Even if you just want to know what Ashton Kutcher is eating. You've received your first party invitation of the social season and you have no idea what to wear. Does that black necklace go with that new sequined dress? Are boots cool for a cocktail event? Exactly what does the host mean when she says the attire is "creative black tie''? Birmingham fashion blogger Alexis Barton of www.samechicdifferentday.com wants to put your mind at ease. On Friday, December 7, at 12:00 p.m., she will give style tips as part of "Fashion Friday,'' which will be held on the fourth floor of the Linn-Henley Research Library, 2100 Park Place. The program, presented by the Birmingham Public Library and Birmingham magazine, is free. Library fashion books and more will also be available to help you achieve your best look for the season. For more information, contact Birmingham Public Library Public Relations Director Chanda Temple at ctemple@bham.lib.al.us. Join us for our annual tradition with Birmingham storyteller and actress Dolores Hydock as she presents A Christmas Memory. Truman Capote's poignant reminiscence of his boyhood in rural Alabama is brought to vivid life in this wonderful holiday performance. Wednesday, December 5, noon. There will be an encore performance Tuesday, December 11, at 6:30 p.m., at the Central Library. Feed your body and mind at BPL's Brown Bag Lunch programs. You bring the lunch and we'll bring the drinks. Central Library, Linn Henley Research Building, Arrington Auditorium, 4th floor. For more information call 226-3604 or visit www.bplonline.org. Gifts of a Wordsmith workshop will take place on the library's second floor in the Story Castle. The topic for the December 4 session will be "Creative Writing: The Process and Performance" and features Kodisha Soulscribe Taylor speaking on the topic. These poetry workshops are held every first Tuesday of the month from 6 to 8 p.m. at the downtown Birmingham Public Library and is funded by the Friends of BPL. John Paul Taylor is one of the founders of Real Life Poets, a nonprofit creative writing program based in Birmingham. Workshop: "Creative Writing: The Process and Performance"
The Friends Bookstore is hosting another Fill-a-Bag book sale through Friday, December 21. The store will hand out free cloth library bags and for $6 you can fill them with as many books as you can stuff inside. Friends members will receive a discount on top of this insanely low price. If you're not already a member of the Friends of the Birmingham Public Library, you may join at the store and receive the discount. The Bookstore is making way for new inventory, so come do some Christmas shopping for books and gift store items and help them clear the shelves. Proceeds go to fund library programs. The Bookstore is located on the 2nd floor of Central Library's East Building, and the hours are Monday-Saturday, 9:30 a.m.-5:30 p.m., and Sunday, 2:30-5:30 p.m. For more information call 205-226-3676. New from your library - Auto Repair Information Online! BPL has now added the Chilton Auto Repair Library to its list of online services available to Birmingham residents. Users can access it in the library itself or from the convenience of your own home. Just go to the Databases section of the BPL website and simply select ChiltonLibrary from the Database Quick Links. Then you can immediately start exploring this wealth of useful and up-to-date automotive information. Chilton Library provides exclusive photographs, diagnostics designed by instructors, step-by-step repair procedures, Original Equipment Manufacturer (OEM) maintenance schedules, wiring diagrams, recalls and Technical Service Bulletins (TSBs) for automobiles and light trucks in one easy-to-use web site. You will also find many step-by-step video tutorials to guide you through the repair process. To access Chilton Library from home will require a valid JCLC library card and residence in Birmingham, Alabama. The memoir of Melba Pattillo Beals tells of 1957 when nine African American students became the first to integrate Central HS in Little Rock, Arkansas, where they were met with harassment, name calling, and physical attacks on a daily basis, yet were told not to resist or retaliate to avoid further dissension. These nine students, one senior and eight juniors, were selected to integrate based on their grades and performance at their former segregated high school. Because of the Supreme Court Brown v. Board of Education decision in 1954 that outlawed segregation, the local chapter of the NAACP selected Central HS to integrate, an act which was met with instant opposition from Arkansas Governor Faubus. Picking up on the Governor’s segregationist agenda, students and their parents devised a wide variety of bullying tactics, from spraying ink on the clothes of the African Americans to following so closely that their heels were bloodied, stabbing them with sharp objects, pushing them down stairs, spitting on them, and using racial slurs with all kinds of threats attached.Their families were threatened, Melba’s mother almost lost her job, and their phones rang continually with obscene remarks and promises to kill them. Although eight of the nine made it through the school year (Minnijean was expelled but was sent to attend a private school in NYC), the high schools in Little Rock were closed for the next three years and Melba was eventually sent to live with a family in California to finish her high school education.